Could This Invention Change Everything About Commuting? The Smart Wheel by FlyKly Bikes is a motorized bike wheel that can fit on almost any bike, instantly turning a regular bike into an electric one, opening up the options of who can bike commute, where, how far and in what terrain. Bike commuting in urban areas has the potential to combat an enormous number of problems: traffic congestion, air pollution, gas consumption, and commuting affordability. But would-be bikers are often limited by various constraints, including weather, physical condition, cost and time. In most of the cities with the worst traffic, commuters are constrained by hills, heat and sprawling distances. Electric bikes, which have motors attached to them, were meant to solve some of those problems, but often end up being prohibitively expensive. Some e-bike lines’ most basic models start above $1200, and can easily surpass $2000. “We want to make cities more livable, and make them more people — not car — friendly,” says Klansek. Enter the Smart Wheel, a wheel that can replace almost any bike’s back tire. The wheel hub has a self-contained, battery-powered motor that can propel a bike at speeds as high as 20 miles per hour for as far as 30 miles on one charge. The wheel recharges itself when coasting downhill. 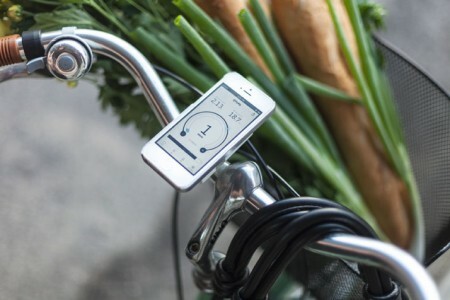 The device earns its “Smart” moniker by being operated completely through one’s smartphone, which stays put on a handlebar mount (that also serves as a bike light and a phone charger) and connects to the wheel through Bluetooth. The FlyKly app monitors speed, distance, time traveled, location and route. The wheel can be locked via the app, and if the bike starts to move when the phone is not nearby, the app sends a message alerting its owner to a possible theft. Given the incredible early show of support, achieving their goal seems quite plausible. The company launched a kickstarter this October with a goal of raising $100,000. They have already raised over $275,000 and counting. Though FlyKly has not yet decided what the final price for the Smart Wheel will be, they assure it will be far less than an electric bicycle. Since the wheel is removable, the invention is also more versatile than an e-bike. After all, sometimes you want to be the one powering your bike with your own pedaling. But when you don’t, or can’t, Smart Wheel will be there.